Galaxy clusters are fundamentally objects of exception. As the largest and most massive gravitationally-bound objects in the universe, they represent the rarest consequence of structure formation. Because of this rarity, our standard cosmological theory, known as the model, makes very precise predictions about how many galaxy clusters should exist, when they should form, and how massive they should be. It turns out that the existence of very massive clusters at high redshift (early times in the universe’s history) is exponentially suppressed with increasing mass and redshift. Thus, the discovery of just one particularly massive cluster at high redshift can be a powerful test of our standard cosmological theory. 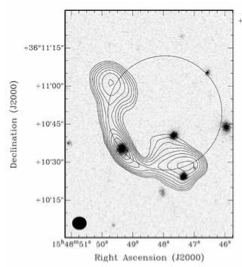 The authors of this paper have aimed to constrain using the galaxy cluster IDCS J1426.5+3508. Located at a redshift of z = 1.75, it is the most massive cluster yet discovered at z > 1.4. The presence of a cluster at this redshift is not surprising, as it is believed that galaxy clusters begin to form around z ≈ 2. However, IDCS J1426.5+3508 is unusually massive for clusters at this epoch; it is more massive than all but one of the published galaxy clusters with z > 1.2. Despite its unusually high mass, a recent analysis showed that the existence of the cluster is still consistent with a cosmology. Figure 1: Infrared images of IDCS J1426.5+3508 taken with the Hubble Space Telescope, showing the combined cluster center and arc (left) as well as a close up of the arc (right). Figure 1 of Gonzalez et al. (2012). What really makes IDCS J1426.5+3508 so unique and interesting is that, in addition to its high mass and redshift, it serves as a strong gravitational lens, distorting the image of a background galaxy into an extended arc (see Figure 1 above). As the light from the background galaxy passes by the cluster, the enormous gravitational potential well of the cluster bends the path of the light, focusing it like a lens. The end result is that observers on Earth see the image of the galaxy as an arc. By studying the specific shape and size of the arc, in combination with the known mass of the cluster, the authors are able to determine that the background lensed galaxy must be extremely distant, between 3 ≤ z ≤ 6. Figure 2: Predicted number of giant arcs over the sky as a function of the observed magnitude of the arc in two infrared wavelength ranges. The two ranges are labeled F775W (red) and F160W (black). Figure 3 of Gonzalez et al. (2012). The authors address one main question: given a standard cosmology, what is the probability for such a massive, strong lensing cluster to exist? Their answer to this question is startling. They find that under realistic assumptions the cluster plus giant arc system simply should not exist. The authors reach this conclusion by computing the predicted number of giant arcs behind clusters at z > 1.75 as a function of the brightness of the arc at infrared wavelengths. Figure 2 shows this result for two separate infrared wavelength regions (denoted as F160W and F775W)1. At the measured brightnesses of the giant arc, both curves predict that less than one arc should be present over the whole sky; or in other words, the observed lensing system should not exist! The three main sources of uncertainty are the “lensing cross-section” (the efficiency of high-redshift clusters to lens background galaxies), the expected number of clusters as a function of mass, and the distribution of background galaxies. These last two areas are reasonably well-constrained by past observations so the authors argue that errors in the lensing cross-section modeling could help to explain the observed discrepancy. This modeling depends upon the detailed morphology of high-redshift clusters, which could differ significantly from current models. It seems that only a larger sample of massive, high-redshift clusters can decrease these uncertainties and help to explain the existence of this rare lensing system. 1 The filter F775W is centered at a wavelength of 775 nanometers and is used on the Advanced Camera for Surveys, while the filter F160W is centered at a wavelength of 1600 nanometers and is used on the Wide Field Camera 3. Both instruments are on the Hubble Space Telescope. 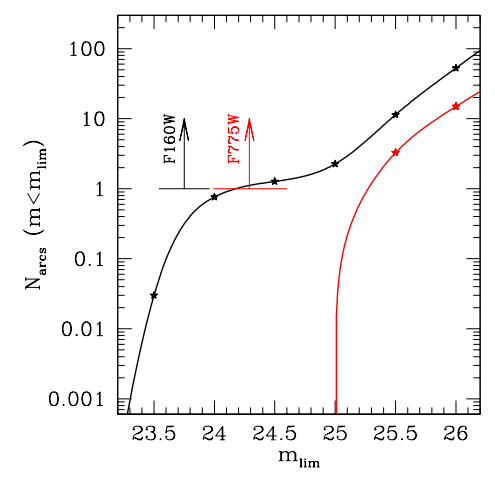 Another interesting question one might ask is how the authors managed to fit a spline to only two points (Figure 2, red curve)! There are more than two points. All the points at mags brighter than ~25 are *zero* (not shown on a log plot for obvious reasons). This calculation is all-sky, not just for the survey area. And what are the error bars on the points, including those that are zero?